This table lamp features double shades and dark tones to add an industrial touch to any decor. Inspired by the clean industrial designs of the early 1900s, this table lamp is sure to bring an appealing touch to your home. A dark oil-rubbed bronze finish on the base complements the lighter neutral double shades. Two pull chains operate two bulbs independently for easy light control. 26" high overall. Inner shade only is 16" wide x 7 1/2" high. Outer shade only is 18" wide x 6" high. Uses two maximum 75 watt standard-medium base bulbs. Twin on-off pull-chains. 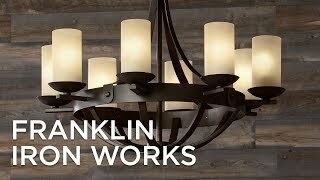 Andes industrial modern table lamp by Franklin Iron Works™. Stacked double shade design. Polyester shade fabric. Oil-rubbed bronze finish. Metal construction. I’m really loving the MCM vibe of this lamp. Can’t wait to get it home! I like the clean lines of this lamp and the sophistication of the double shade that dresses up the "industrial" style. It will be placed near a window and its lean base will not block the natural light or view. I chose this because the shade is a light color that matches my walls. If this shade is a dark brown as one customer said in a review I don’t want this lamp. Please advise. They have a very unique look. Because it's different. And I like the clean look. Like the design and fits with other lamps in our home. Style is great. 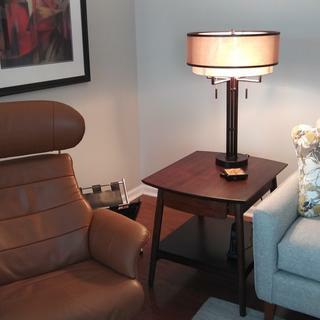 These two table lamps will coordinate well with a Franklin Iron Works floor lamp I purchased a few weeks ago. Because it matched the floor lamp that I wanted. Good look and and powerfull light. Love the clean lines, unusual double shade...it's classy. I wanted a table lamp with an industrial style. This matches the floor lamp I ordered and also my coffee table. I like the simple clean lines. And it's not something I've seen before. I really like the modern look and color. Fits my clients needs perfectly! I was looking for something for a masculine bedroom with Mission-style furniture and most Tiffany-style lamps are too short or look too feminine for the room. I’m hoping this lamp will strike the right balance. I like the looks. Pretty much what I was looking for. I need a non-glass option for a living room side table. This is stylish, a little rustic, a little industrial and very different. How much does the Andes Double Shade Industrial Table Lamp weigh? I need something with weight that a cat cannot easily knock over. BEST ANSWER: The lamp weighs approximately 8 pounds. It's heavy. Definitely heavy enough to withstand a brush with kitty. But, as you can see, because the shade is so large, it's a bit top-heavy and could topple if the cat caught it just right. Beautiful lamp, though, and I've loved having it in my living room. what is diameter of base? BEST ANSWER: It's exactly 7". SUCH a perfect pick for us. We have two, and they finish the room beautifully! Mine is approximately 6.75 inches. Love this lamp. Is it cordless? BEST ANSWER: Sorry, it’s not. Cord comes out at bottom. It’s a very solid and stylish piece. No, it is not cordless. The cord is about 5 ft long. No....it’s a regular table lamp. How many inches does the inner shade come down from the outer shade? Looking for total height of both shades. BEST ANSWER: About 1.5 inches of the inner shade shows below the outer shade. The height of both is just under 27”. Is the top of the shade covered or open? Yes, both interior and the outer shade are open. Does the shade have pinkish overtones? BEST ANSWER: No - the shade is beige. Great lamp. Color of shade is beige with no pink undertones. Looks amazing and industrial. What is the distance between the table top that it is sitting on and the bottom of lowest shade? BEST ANSWER: It is 19 3/8 inches from the table top to the bottom of the lowest shade. Love this lamp! It's a little more than 19". An absolutely beautiful lamp! How tall is this lamp and what color the base? BEST ANSWER: Hi, the overall height is 26" inches from the bottom of the base to the top of the finial. The base is Oil-rubbed Bronze. Yes, just under 27” and beautiful oil rubbed finish. Great lamp!! How do you clean the shades? Can I get replacement shades if needed, in time? If not, would any drum shade work? 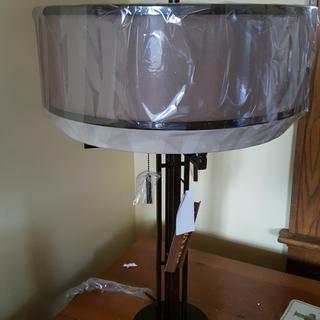 BEST ANSWER: Hi Lisa - we do offer a lamp shade cleaner Style #43093. At this time, replacement shades are not currently available. But, if you plan on using other shades, they will need to have a spider fitting. Is the shade on the Andes table lamps by Franklin the same color as the shade on the Durango floor lamp also made by Franklin? BEST ANSWER: I'm not sure about the Durango but the Alamo floor lamp by Franklin matches perfectly. I found it on the American site rather than the Canadian site....both lamps plus. I only bought the lamps but absolutely love them!!! Yes. The outer shade on the Andes table lamp is the same shade that is on the Durango floor lamp. Love both of them! Yes, they match! And beautifully. They gather many compliments. Solidly made no worries about wobbling. What is the material of the (two) shades? BEST ANSWER: They are polyester shades. color not true to photo...not even close! Hi Lisa T., thank you for the feedback, and we are especially grateful for the image you attached here. The photograph of this lamp was taken in a photography studio where the lighting is bright enough to highlight the finish tones and features. It may look darker when brought into different people's homes simply due to the amount of lighting that may already be present there. If you have any questions or would like further clarification, please reach out to our customer service team for assistance. Thank you! These reminded me of shades my grandmother had years ago. The shades are very unique and are so different than I have seen anywhere else. I love having things you don't see in anyone else's home. The lamp is very sturdy and the pull chains are strong. It takes two light bulbs so we put one daylight and one soft light bulb in each lamp and it gives a totally different look. You can have one light on at a time or both...fantastic!! The base is simple but totally accents these amazing shades. The colours shown in the pics are very accurate. So pleased we chose these!! A new twist on style! Beauty lamp, a modern look to a classic room, the double round shades have a unique style. They catch everyone’s eye who enters the room, “ where did you get those” !! Top of the Line bedroom lamp. We love it! Very classy, high quality and superior construction. Love this lamp. I bought two. Great looking, excellent lighting. Well made. Impressed with the quality and look of this lamp. It completes the look we wanted and we recieve many nice complements. Beautiful lamp! Arrived on time and packed securely. Would highly recommend. This is a gorgeous lamp. So unusual with the double shade. Makes a statement in the room. Really loved the construction and style. It is a bit tippy as the top is a lot larger than the base. It was not an issue for me as we have no large dogs or children. All and all I love it. I love these lamps. Very classy. Looks really good. Great attractive, solid tablellight for mid modern decor! Wonderful well made lamp. Different-- not your ordinary lamp. I just recently bought these lamps and I absolutely love them. I had a family gathering last weekend, and probably got ten comments about these lamps and where I got them...they are beautiful! Stately looking lamp with versatile lighting-use one bulb or both for different lighting situations. Easy on/off with pull cords. Beautiful lamp shade.